Our first big product release of the year was MileOn by PC*MILER. Powered by ALK’s flagship PC*MILER® routing, mileage and mapping software, MileOn is a much-needed tool for trip planning, scheduling hours of service (HOS) breaks and choosing the right rest stops for your needs while staying DOT compliant. The app also offers drivers crowdsourced truck parking. Truckers can download MileOn for free on the Google Play Store. Shortly after, we released version 32 of PC*MILER. The software utilizes new cloud technology and enhanced functionality. Version 32 lets users easily create and manage custom content and share that content with colleagues for more efficient and consistent operations. Get your free trial now. Later in December, we released CoPilot 10.9 which brings enhanced navigation, routing, guidance and ETAs to help maximize fleet safety, compliance and efficiency. Version 10.9 features Side of Street routing, map routing views, ETA alerts and much more. Together with our partners, we support businesses working across multiple industries with our software solutions. In 2018, we had a closer look at how mapping, routing and navigation technology can help companies in such diverse industries as Transport & Logistics, Emergency Services, Utilities and K-12. We also examined how to embrace the final mile in the postal, parcel and courier sector. In 2018, our teams attended over 55 trade shows and industry events across the globe. We connected with customers and partners, spoke at conferences, took part in industry thought leadership panels, and exhibited the latest products in our newly designed trade show booths. Some highlights include LogiMat, MATS, GATS, TMW’s & Peoplenet’s in.sight user conference, PostExpo, Trimble Dimensions, the 3PL Supply Chain Summit and many more. ALKers have always cared about giving back to our local communities and in 2018 we ramped up our efforts under the motto “ALK Gives Back”. We supported multiple charities and worthwhile causes across the globe. In our “Day of Service” initiative, we supported three local programs with over 45 volunteers supporting environmental and community projects between our Princeton and London offices. Through the ALK ugly holiday sweater fundraiser, our US offices donated to Wildfire Relief Fund while our European offices donated to Save the Children and Les Blouses Roses. The Princeton office also hosted their 12th annual food donation drive for Thanksgiving while our London office continued its tradition of donating toys to Great Ormond Street Hospital (GOSH) . The London office also started a new initiative to donate food, clothing and employee time to Ace of Clubs, a community centre to help vulnerable people. ALK is also honored to have aligned ourselves with St. Christopher Truckers Relief Fund in the US and Eastern Alliance for Safe and Sustainable Transport (EASST) in the UK as corporate charity partnerships. We kicked off the year with employees taking part in a two day event including multiple knowledge sessions and innovation labs as part of our Raise the Bar series. Innovation is at the heart of our business and has always played an essential part in ALK's success. What better way to explore innovation than with our very own innovation labs? Employees were split into teams and challenged to brainstorm a new innovation for the company, based on a topic that was dedicated to their team. In the summer, ALKers were encouraged to further their own professional development under the motto “Let’s Learn”. Everyone at ALK had access to LinkedIn Learning, an online learning platform to help employees achieve professional aspirations and help develop them professionally. ALKers were able to choose from a variety of online self-paced courses and ended up completing 450! We are already working on some big updates and innovations to improve your business and transform journeys in 2019, so stay tuned. 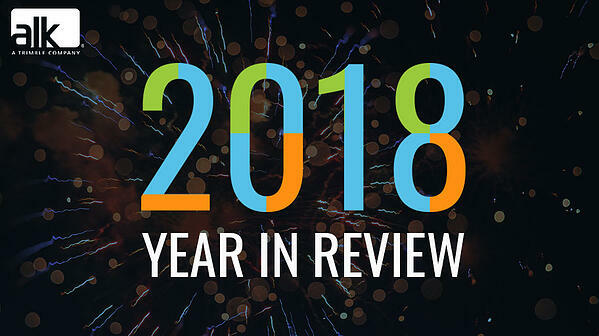 We thank all of our customers and partners for being by our side in 2018 and are looking forward to a successful new year together!